a. General- This explosive charge (fig. 5) consists of eight blocks of tetrytol strung on a 16-foot length of detonating cord (primacord) and packed in a haversack. It is provided primarily for demolition purposes. The entire chain, or any part of the chain, may be used laid out in a line, wrapped around an object, or as packed in the haversack. Since tetrytol is more powerful and more brisant than TNT (par- 23), this explosive is more effective in cutting steel and in demolition work. The blocks and detonating cord are comparatively insensitive to shock, but the assembly, which includes a tetryl pellet, is slightly more sensitive than TNT (par. ¿3). 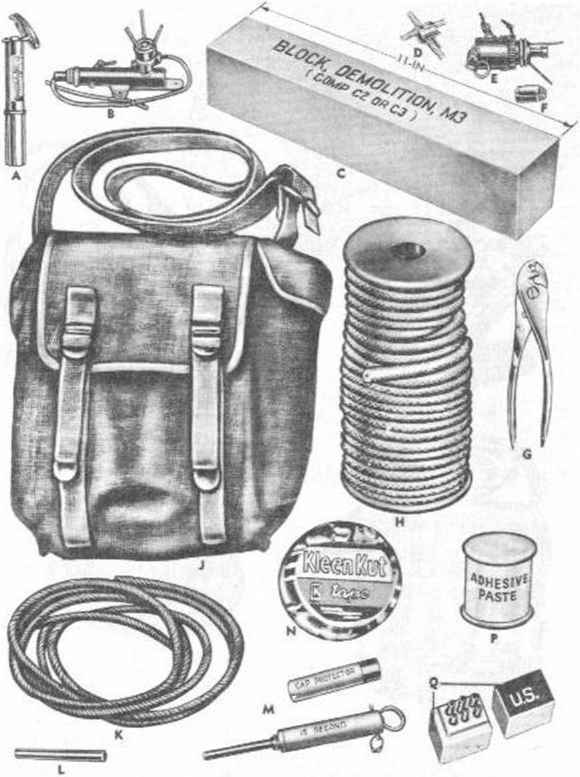 The detonating cord is detonated by a blasting cap or a detonator. Simultaneous detonation of unconnected blocks can be obtained when separated by as much as 10 inches of air. b. Description. Each block of the eight blocks is rectangular in shape, 11 x 2 x 2 and enclosed in a crinkle-kraft paper bag. 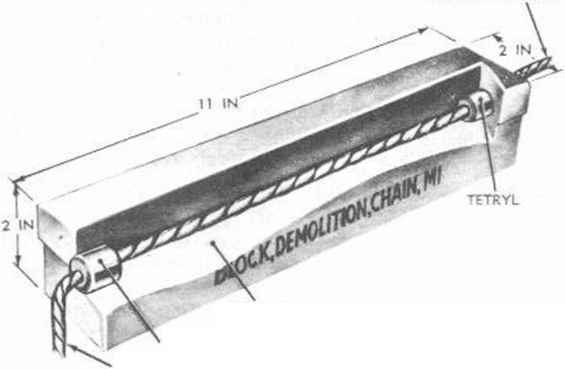 The blocks are cast in place on the detonating cord with 8 inches between blocks and 2 feet of detonating cord at each end. The charge is 75/25 tetrytol, with a cylindrical pellet of tetryl cast in each end of each block. Printed on the paper bag covering in at least one place is the designation: «BLOCK, DEMOLITION, CHAIN, Ml (TETRYTOL). MI ST BE DETONATED BY ORDNANCE CORPS U. S. ARMY BLASTING CAP. ONE BLOCK=SIX %-LB TNT BLOCKS." c+ Packing. One chain is packed in a haversack, two haversacks (two chains) pqr box. The dimensions (in.) of the haversack are approximately 1 xSix anil its weight as packed is 22.5 pounds. a. General. Demolition block (fig. 6) is similar to one of the eight blocks of BLOCK, demolition, chain. Ml (par. 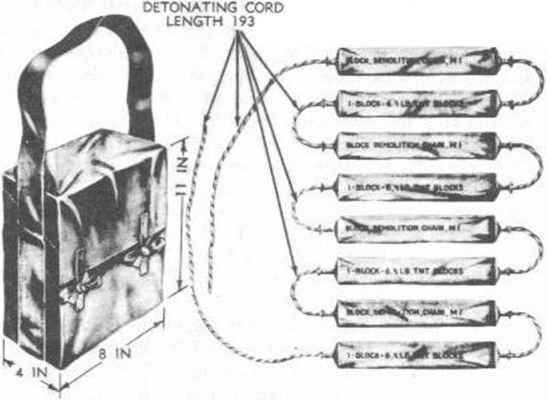 1«), except that, instead of a central core of detonating cord, there is a detonator well in each end.